Nestled in the foothills of the valleys, the private and artistically designed pool villa is an exclusive and perfect hideaway for a weekend or a couple of weeks. The villas are located in the Black Mountain characterized by outstanding dining and facilities for the pleasure of modern travellers. 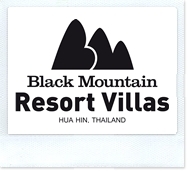 Located just 10 kilometers from Hua Hin, Black Mountain Resort Villas is close enough to take full advantage of the city and beaches, while living in an idyllic rural environment.